For a trial period (April to June 2012) Council meetings are held on the last Thursday of each month commencing at 5.30 pm AND the second Wednesday before the last Thursday of each month commencing at 8.30 am. Council meetings are held in the Council Chamber at Council's Administration Centre—44 Princess Street, Macksville. The report concerns obtaining an order from the Minister for Local Government to avoid a bi-election to fill the vacancy created by the passing of Councillor Michael Moran OAM. There are no feasible options. With the scheduled Council elections on 8 September 2012 being less than 3 months away there is no justification for a bi-election to fill the casual vacancy. In relation to the passing of Councillor Michael Moran OAM on 24 May 2012, the Local Government Act provides that where a casual vacancy occurs within 18 months before the next scheduled election, the Minister may, on application of the Council order that the vacancy not be filled. With the next scheduled election to occur in less than three (3) months on 8 September 2012 it is recommended that Council seek an order from the Minister for Local Government that the casual vacancy not be filled. This will save the Council the cost of a bi-election which would likely be in the order of $40,000. (1) This section applies if a casual vacancy occurs in the office of a councillor, including a mayor elected by the electors of an area, within 18 months before the date specified for the next ordinary election of the councillors for the area. (b) order the holding on a stated day of a by-election to fill the vacancy and revoke any earlier order made under paragraph (a). (3) If such a casual vacancy occurs in the office of a mayor elected by the electors, the casual vacancy is to be filled by the Governor appointing to the vacant office a councillor nominated by the council. (4) If the council does not nominate a councillor for the purposes of subsection (3), the Governor may appoint one of the councillors to the vacant office. There has been consultation with the Division of Local Government. They require a resolution from Council to seek an order from the Minister under Section 294. There are no particular risks. The Minister for Local Government can require that a bi-election be held, but given the closeness of the 8 September 2012 election, this is considered unlikely. There will only be a budgetary impact if the Minister requires a bi-election. This is considered unlikely. Advice received from Forests that they would be prepared to enter into negotiations with Council. A feasibility study will be required to determine costs and issues and address legislative matter – it is proposed to provide a report to Council in May. Re road name Kenwil Drive, that the matter be deferred to enable the policy to be reviewed and exhibited and then the recommendation, that Council advertise its intention to name the road “Ken Wilson Drive” be reconsidered. In accordance with Council’s direction for 3 weeks notice the matter will be considered in May 2012. IPART has advised that it has approved Council’s application for a special rate variation in full. IPART determined that Council has made gains in productivity and reduced costs in the recent past and shows no signs of being inefficient relative to its peers based on the available comparative data. However they also advised that it is appropriate for Council to continue to identify opportunities for productivity improvement and cost savings and to report the impact of these to the community. Importantly IPART has observed that the special rate variation will not address the underlying issue of the council’s longer term recurrent sustainability. The Asset Renewal Ratio is forecast to fall from 0.71 this financial year to 0.68 in the year ended 30 June 2015. IPART indicates that Council should consider its longer term financial position and pursue a range of funding options. That the approval, in full, of Council’s appIication for a special rate variation by the Independent Pricing and Regulatory Tribunal (IPART) be noted. On 4 June 2012 the Independent Pricing and Regulatory Tribunal (IPART) advised that it had approved Council’s application for a special rate variation in full. Of the 152 Councils in NSW, IPART received applications for special variations from 14 councils. 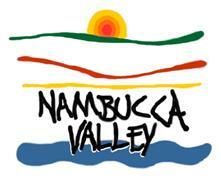 Nambucca Shire Council was one of 7 councils which had their application approved in full. Financial analysts from IPART have been scrutinising Council’s application since its lodgement in late February. The fact that IPART have been satisfied in relation to all of their assessment criteria is due in large part to the Council’s Manager Financial Services who assembled the application and responded to IPART’s regular requests for information. The approval of the special variation means that on average, residential rates will increase by $28 (or 3.5%), business rates will increase by $119 (or 8.0%) and farmland rates will increase by $4 (or 0.25%) in 2012/2013. A copy of the media release issued by IPART together with the report on their determination is attached. In relation to the environmental levy program, IPART has accepted representations from Council that in the event of the sale of the Macksville Showground, the environmental levy works program can be adjusted to bring in new projects or expand existing projects. IPART also accepts that the environmental levy program of works is indicative and the council may need to re-schedule and re-prioritise planned expenditure on individual projects over the 10 years. The Council is required to report against the expenditure in its annual report. There has been consultation with IPART and Council’s Manager Financial Services. The approval of the special rate variation application means that Council will be able to permanently retain a program of environmental work in its overall works program. This is a significant benefit for the environment. There are no significant economic issues. To the extent that the special rate variation will fund additional capital and maintenance work on Council’s roads will mean an economic benefit to the local area. The determination by IPART means that Council does not have to make any significant changes to its advertised Operational Plan and Delivery Program. Whilst the approval of Council’s application will ensure the permanent continuation of Council’s Environmental Levy works program as well as $1.5m of improvements to Council’s sealed road network, it does not address the underlying issue of the council’s longer term recurrent sustainability. This will require a greater effort to fund depreciation and achieve an asset renewal ratio closer to 100% instead of the current 71%. This remains the challenge for Council’s sustainability. There is no impact on working funds. The approval of the special variation has already been incorporated in Council’s Operational Plan and Delivery Program budgets. Council is seeking to take out a loan for $925,000.00 for a 20 year fixed term interest rate (monthly repayments), $325,000.00 for Bridges and $600,000.00 for Roads. The financial institutions will be submitting their offers to Council on 12 June 2012. Upon receipt of these offers, a late report will be tabled for consideration in Closed Council. The loans are provided for in the 2011/2012 adopted budget. The purpose of this report is to advise on investigations into using Facebook or Twitter as per Council’s resolution 15 March 2012 “that staff be asked to consider and report back to Council regarding the use of Facebook or Twitter to communicate with young people”. Facebook and Twitter are powerful internet tools of communication and are fast becoming another alternative to communicating with community members. Consultation with other Council’s who use Facebook as a communication tool indicated that whilst, Facebook is a great way of communicating with young people providing the information is relevant, current and accurate. However, it opens up a range of resourcing and monitoring issues for Council. Most of the Council’s consulted have a Youth Advisory Committee undertaking the monitoring task (sometimes daily) with input from the Youth Development Officer (weekly usually). Also, some other Councils have their IT Department monitoring the Facebook page, along with the Youth Development Officer and Youth Advisory Committees. Nambucca Shire Council does not have a Youth Advisory Committee and the IT Department does not have the capacity to monitor a Youth Facebook page. For the Youth Facebook page to work effectively it is essential that there are sufficient staff to monitor it on a regular basis. Promotion of programs/events/activities, at the moment, is delivered in a number of ways: flyers, handouts, school newsletters, school assemblies, Bowraville Newsletter, email to other organisations, emails to parents who on Youth Development Officer’s mailing list, radio stations (local and Coffs Harbour), ads in the local newspaper, articles in the Guardian News and the Hibiscus Happynings Community Diary as well as, Council’s website, Council’s Libraries, word of mouth and texts to young people who are on the Youth Development Officer’s contact list. Whilst there are resource impacts with this process they are event driven with no daily impact and updating. At this stage there is not an effective way of monitoring what appears on a Facebook page by staff in Council. 1 Council endorses the recommendation. 2 Council not endorse the recommendation. Council has asked staff to consider using Facebook or Twitter as a means of communicating with young people. · An account is created which comprises a username, password and an image. o A page is designed for institutions, companies or businesses. Considerable research and consultation with other Councils who use Facebook and/or Twitter has been undertaken by the Youth Development Officer. Councils that were consulted have all agreed that Facebook is a great way of getting information out to young people and the community. Most Councils that were consulted have a “Council” Facebook page as well as a “Youth” page. A regular part of having a Facebook page is monitoring by staff. Monitoring of the page needs to be on a regular basis, as comments can be made by young people and/or the community, which can be seen by anyone who goes to the page. Further, it may be necessary to capture posts to the page as Council correspondence or for Council’s Customer Complaints system. In these cases, the use of Facebook adds an additional source of correspondence to be managed. Most of the Council's Youth Facebook pages that were looked at are monitored by Council’s Youth Advisory Committee with perhaps weekly monitoring by the Youth Development Officer. Some Youth pages are monitored by Council’s IT Department also. Nambucca Shire Council’s Youth Advisory Committee was disbanded over 4 years ago due to the lack of interest from young people. When the Youth Advisory Committee was disbanded, it was thought that Council’s Youth Development Officer could use Myspace or another type of web based network to communicate with young people. This proved unsuccessful, as the young people were eager when setting up the page, but lost interest, moved onto other things or moved out of the area. The Youth Development Officer promotes events using multiple avenues, eg, flyers, handouts, texts, emails, Council’s website, newsletters and assemblies. Most of the Council’s consulted also have Twitter linked to their Facebook page. Twitter involves sending “tweets” (messages, links, stories, etc) to “followers”. Again “tweets” would have to be sent by a staff member and be monitored. The Youth Development Officer consulted with young people and also other youth organisations in the area and Twitter is not commonly used, in fact of the 20 young people that were asked all answered that they did not use twitter and are unlikely to in the immediate future. “Tweets” can be sent by either mobile or computer, but the normal practice is to use your mobile and “tweet” about something that is happening now, which would mean that internet access would have to be available on staff mobile phones. Twitter is more of a City network than Rural and mainly used by people in an older age bracket and would not be effective as a means of communicating with young people in the Nambucca Valley. To open a Facebook and Twitter account an email address would be required, eg ydo@nambucca.nsw.gov.au, which can be set up for an approximate cost of $75 per year, for the license, by IT. Attached for Councillors information are examples of Hastings Youth Advisory Council Facebook page and also a copy of Port Macquarie-Hastings Council Facebook page for information. You will note that comments (posts) made on the Port-Macquarie-Hastings Council Facebook page about potholes in the roads have been put under a story about the new turf being laid for the Port City Hockey Club. Port Macquarie-Hastings Council employ a full-time Communications and Web Officer who deals with Council’s webpage, Facebook page and any other internet work. When comments are made on the page, the Officer takes a “screen dump” (picture) of all comments which appear on the page. These “screen dumps” are then saved as a JPEG image and filed electronically in Council records management system, eg TRIM. Although Port Macquarie-Hastings is a much larger Council than Nambucca, the same would apply to any information relating to Council business. There is nothing to stop a community member “posting” on the Youth Facebook page about an issue with roads/bridges/footpaths, etc. Also businesses can “post” on the Youth Facebook page advertising what they do. As continual and regular monitoring of a Facebook page and/or Twitter account is necessary for them to work effectively, it would be essential that there be a number of staff doing this. At this stage Nambucca Shire Council does not have the staff resources to do this. Small element of risk regarding derogatory comments and/or pictures without permissions. There are no issues identified. 1 That the Committee note the recommendations of the Minutes of the Meeting held Tuesday 24 April 2012, as presented to Council at its meeting of Wednesday 16 May 2012. 2 That the Committee confirm the Minutes of the Meeting held Tuesday 24 April 2012 as an accurate record of the meeting. 5 The feedback from Council’s Waste Officer regarding garbage bins on footpaths. The item of correspondence and related actions was noted. A request from Open Arms disability service was discussed. It was in regard to the need for disability parking spaces to allow rear of vehicle access by people in wheelchairs. The Committee asked Ms Sky to discuss the matter further with the service to determine if there are specific areas of need and further if there are zones where they can unload or regular parking spaces which provide better options than the designated disability spaces. The next meeting will be held on 26 June 2012 commencing at 1.30 pm. There being no further business the Chairperson then closed the meeting the time being 3.20 pm. The following is the Contract Regulatory Officer’s Report for May 2012. Council has sought further information in regard to the River Ecohealth Programs and the costs associated for consideration. Bellingen Shire Council, Port Macquarie Hastings Council, Coffs Harbour City Council and Clarence Valley Council are participants in the program and Mr Max Osborne, Project Officer with the Northern Rivers Catchment Management Authority made a presentation to the Nambucca River, Creeks, Estuaries and Coastline Management Committee. Costs have been obtained for the Bellingen project and the estimates indicate a commitment of $62,000 so far. This is made up of $34,000 for water quality monitoring, $18,000 for a fish study, $8,000 for a macrophyte study with the remaining $2,000 going towards printing and graphic design and signage. The costs are based around the number of sampling sites and the length of the river between the sites. Estimates suggest around $3,000 per site and there would be somewhere around 20-30 sampling sites on the Nambucca. Approximately $60,000-$90,000 for the Nambucca River project. It would be expected that Council could receive $ for $ funding, $20,000 has been identified in the draft Environmental Levy for 2012/2013 and 2013/2014 as Council's contribution towards a grant. 1 That Council adopt the recommendation. 2 That Council not adopt the recommendation. Following a presentation to the Nambucca River, Creeks, Estuaries and Coastline Management Committee by Mr Max Osborne Project Officer with the Northern Rivers Catchment Management Authority on the Bellingen Shire Council River Ecohealth project, the Committee recommended to Council that it investigate opportunities and costs for the Ecohealth project to be considered for the Nambucca River in the future. Council subsequently endorsing the recommendation. Attached for Council's information is a paper prepared by relevant officers of the Northern Rivers Catchment Management Authority and the Office of Environment and Heritage about the River Ecohealth project on the Northern Rivers. The paper provides a comprehensive outline of the project, its outcomes and outputs. $25,000 has been provided in the draft Environmental Levy program for the next few years for Water Monitoring and River Health Program. $20,000 specifically for the River Ecohealth project as Council's contribution as $ for $ funding is available. A total budget of $80,000 is considered appropriate for the Nambucca River project due to the work already undertaken by Newcastle University on Newee Creek and by Damon Telfor on the Lower Nambucca. The project is likely to provide further information for Council to better manage discharge points into the river. The project will assist Council, Landcare groups and landowners secure funding to assist with riparian lands management and also support the Oyster Industry with their own Management and Operational Plans. There are significant Environmental benefits with the River Ecohealth project. Identification of water quality provides for improved social benefits with a clear indication of the general quality and health of the water and the river. There are economic benefits knowing water quality just as there may be an economic impact if pollution sources are identified which require investment by individuals or public authorities. With the water quality assessments already undertaken the risks are negligible however, if other potential pollution sources are identified this may pose a serious risk if no action is subsequently taken. Through the allocation of funds from the Environmental Levy and provided grant funds are sourced it is unlikely that any unidentified costs will impact on the current of future budgets. Following complaints regarding dogs roaming free, Council's Contract Regulatory Officer attended the site being 145 Strawberry Road Congarinni. As a consequence of this visit, a letter was sent advising that the landowners/occupiers (Mr & Mrs Dalley) are in breach of Council's Local Approvals Policy – Keeping of Animals due to twelve (12) dogs being kept on the premises when only two (2) are permitted by the Policy. This matter has been ongoing since the initial letter sent on 4 July 2011, follow up letter on 23 August 2011, Notice of Intention to issue an Order on 8 March 2012 and a formal written responses received on 15 August 2011 and 11 April 2012 all attached. Council could adopt the recommendation as provided. Council could choose to advise Mr and Mrs Dalley that they would support such a variation without the need for a Development Application but place a time limit on the variation of say 6 months after which only two (2) dogs remain on the property. This would not over ride Council's regulatory responsibilities if further complaints are received. Following complaints regarding dogs roaming free, Council's Contract Regulatory Officer attended the site being 145 Strawberry Road Congarinni. The Regulatory Officer found that some twelve (12) dogs are housed on-site without an adequate enclosure. As a consequence of this visit, a letter was sent on 4 July 2011, advising that the landowners/occupiers are in breach of Council's Local Approvals Policy – Keeping of Animals due to twelve (12) dogs being kept on the premises when only two (2) are permitted by the Policy and that the dogs are not identified or registered in accordance with the Companion Animals Act. The landowners are Registered Dog Breeders and they were advised that Development Consent is required should they wish to continue as a breeder. Mrs Susan Dalley wrote to Council on 15 August confirming that they are no longer breeding and wish to retain the animals as pets as they have had some of the dogs for 20 years. Council responded outlining the information that they would need to provide and the applicable standards that would be applied if approval was granted. Details were also outlined on the notification process to adjoining or nearby neighbours once an application was received. No response or formal application was received from Mrs Dalley, which resulted in a Notice of Intention to issue an Order being issued on 8 March 2012. Mr Dalley on behalf of Mrs Dalley met with the Director Environment and Planning on 14 March 2012 followed by a letter received on 11 April 2012. The letter is initially to enquire whether Council would consider such a large variation to the Policy due to the costs associated with a Development Application. Under the provisions of the Local Approvals Policy the only mechanism to vary in such numbers, is via a Development Application. As they have advised they are no longer breeding the application would be for the keeping of a specific number of dogs and they would need to clearly demonstrate how they will manage the amenity issues that are likely to arise from the keeping of such numbers noting the complaints received to date. The owners have owned many of dogs for 20 years and they wish to maintain them until they pass away. Immediate rehousing of the dogs is likely to place considerable stress on the owners. However, the local amenity of the area must also be considered. There will be costs associated with a Development Application, the construction of the appropriate enclosure and registration of each of the dogs. The Policy was specifically prepared to provide the opportunity for Council to manage and control the numbers of pets and animals housed on the one parcel of land in an Urban or Rural-Residential Area, due to past regulatory and compliance costs when no restrictions apply. Significant variation to the policy as requested without a Development Application is not supported as it will provide an unacceptable precedence. Regulatory costs are incurred with managing complaints. Contract Regulatory Officer's contract includes following up complaints and general fund covers Council staff costs. A development application has been received for a dwelling on Lot 2 DP 1130291, Taylors Arm Road, Upper Taylors Arm. Upon referral from the Health and Building Team to Town Planning it was discovered the dwelling is not located within the approved dwelling envelope. Furthermore, while the approved dwelling envelope met Council’s DCP requirements for rural buffers, the proposed new location for the house does not. The application is referred to Council for determination due to the significant variation to council’s Development Control Plan - Rural Buffers and in particular due to Council's recent resolution to review rural buffer distances to minimise rural land use conflicts. Council staff have formally advised the applicant that the proposed dwelling should be located within the originally approved dwelling envelope and it does not support the proposed new location. The applicant was given the opportunity to withdraw the application. The applicant has requested that the matter be referred to Council for final determination. Council could Resolve to relax the Rural Buffer setback (60m plus a 20m Vegetation buffer or 80m) in this instance and only require setbacks in compliance with the Rural Fire Service requirements and approve the application and apply the recommended draft conditions. 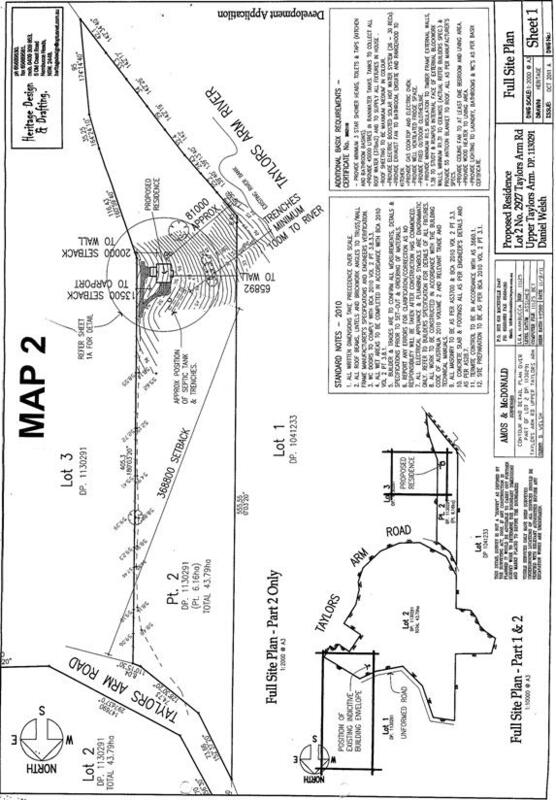 An application for a 3 lot Rural Subdivision was approved on 18 October 2007 which created the subject lot being Lot 2 DP 1130291 (in two parts) with the proposed building envelope being located on the larger part of Lot 2 (see Plan 1 at the end of the Report). Lot 2 is split by Taylors Arm road and the majority of the land is on the northern side (37.63ha) of Taylors Arm Road with the smaller part (6.16ha) located on the southern side and would have been included to meet the 40ha minimum Lot size requirement. When the original subdivision was assessed and approved, the indicative dwelling envelope was located on the northern part near the village of Taylors Arm and met all the required setbacks and buffers. Although the term indicative dwelling envelope is used, this term does allow some flexibility to the location of the dwelling where it sometime moves outside of the parameters sets by the dwelling envelope and not to facilitate a significantly different location. In this instance, the new location is over 1km away from the approved dwelling envelope and moves from the northern portion near the village to the southern portion of land surrounded by rural land (see Plan 2 at the end of the Report). 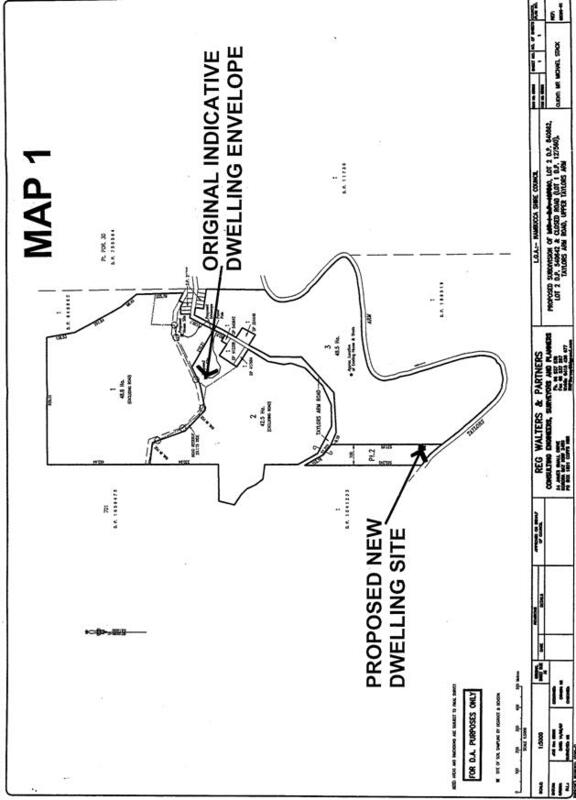 Furthermore, the original subdivision did not require any requests to vary DCP requirements due to the location of the dwelling envelopes, but the proposed new location of the dwelling will not meet Council’s DCP for Rural Buffers. The original subdivision was Integrated Development and NSW RFS provided a Safety Authority Certificate as per the requirements of Section 100B of the Bushfire Act, for the original indicative building envelope. The applicant has engaged Dennis Atkinson Planning to provide justification to the request to vary the DCP requirement in relation to rural buffers. Furthermore, the applicant supports the proposed location by agreeing not to complain about existing or potential future activities and their subsequent emissions of noise, smell etc from the adjacent neighbouring farm land. A note could be placed on the condition of consent to ensure developers of the house are made aware of Council’s Right to Farm Policy, however, there is no opportunity for Council to notify future owners or occupiers of the dwelling once it has been constructed. The opportunity only lies at subdivision stage, when a restriction could be placed on the new Title. A submission has been received by the land owner of the neighbouring rural property, which will be only 20m away from the proposed dwelling at it’s nearest point. The submission reiterates Council’s concerns that his land is used for farming and normal farming enterprises will be undertaken very close to the dwelling and subsequent noise and dust will be produced, in particular as this boundary is used as their main laneway. The submission also raises concerns over the location of the driveway which is as a consequence of where the dwelling is proposed, is very close to the existing fence line in-between the two properties and this area is historically prone to land slips. A condition to provide adequate batters on the road and an appropriate setback to the fence has been included on the draft conditions should Council resolve to approve the proposed amended location of the dwelling. Council can not consider any condition which would relate to the provision of a vegetation buffer to offset for reduced setback as NSW RFS require an Inner protection Zone of 40 metres, or to the nearest boundary (20m at the Eastern boundary), be maintained around the property. With the recent consideration of odours emanating from a free range piggery and Council's resolution to review its Rural Buffers policy and setbacks, this proposal may very well be at odds with the intent of Council's resolution and create a further problem which may not be immediate but may arise as properties change hands and expectations or tolerances of subsequent landowners towards traditional farming and agricultural pursuits. Engineers do not object to the proposal subject to conditions. No objections subject to several conditions and in particular one in relation to driveways details. As the Safety Authority Certificate issued for the subdivision considered a dwelling envelope in a significantly different location to the one now proposed for the house, the application for the house was referred to them. The RFS has subsequently issued a new Fire Safety Authority Certificate which requires a 40m inner protection area (IPA) along with a number of other requirements. No predicted harm to the Environment, subject to the appropriate measures be implanted to prevent land slips. Approval of the dwelling in this proposed location has the potential to cause rural land use conflicts in the future. The objectives of the rural Zones are to encourage sustainable primary production, minimise conflict land uses within the Zone and land uses with adjoining zones and maintain a range of compatible uses, including extensive agriculture. It is possible that having a residential dwelling so close to this valuable rural land could put off land owners, current and future, to extend their farming activities, which would be against the objectives of the rural Zones. Council potentially risks future complaints from future occupiers of the dwelling as Council approved its location very close to a working farm. Any future investigations, smell reports of similar, or legal advice for neighbour disputes, could impact on future budgets. 1 The development is to be implemented generally in accordance with the plans and supporting documents endorsed with the Council stamp, dated *** and authorised signature, and set out in the following table except where modified by any conditions of this consent. 5 An approval under Section 68 of the Local Government Act 1993 for on-site effluent disposal must be obtained from Council. The application for Section 68 approval must be accompanied by a report prepared by a suitably qualified professional with demonstrated experience in effluent disposal matters, which addresses the site specific design of sewage management in accordance with the requirements of the NSW Local Government Act, and Approvals Regulation and Guidelines approved by the Director General. 6 The Principal Certifying Authority (PCA) is to ensure that the proposed development is constructed in accordance with the requirements of BASIX Certificate No 395211S, dated 20 September 2011. The Plans submitted for approval with the Construction Certificate must include all of the BASIX Certificate commitments indicated in this certificate. Where changes to the development are proposed that may affect the water, thermal comfort or energy commitments, a new BASIX Certificate may be required. f drainage (open drains, pipes, etc), including calculations and catchment details. The plans must be in compliance with Council's Adopted Engineering Standard. 9 Toilet facilities are to be provided, at or in the vicinity of the work site at the rate of one toilet for every 20 persons or part of 20 persons employed at the site. Each toilet provided must be a standard flushing toilet connected to a public sewer. No construction work is to take place on Saturdays and Sundays adjacent to Public Holidays and Public Holidays and the Construction Industry Awarded Rostered Days Off (RDO) adjacent to Public Holidays. 12 All builders rubbish is to be contained on the site in a ‘Builders Skips’ or an enclosure. Building materials are to be delivered directly onto the property. Footpaths, road reserves and public reserves are to be maintained clear of rubbish, building materials and all other items. 13 Rainwater tank/tank-stand installations are to be structurally sound, and in accordance with manufacturers detail and/or Guidelines for Plumbing Associated with “Rainwater Tanks in Urban Areas”. Overflow from the tank is to be diverted to the existing stormwater system, or disposed of in a manner not to cause nuisance to neighbouring properties or degradation of land. 14 All of the works indicated on the plans and granted by this consent, including any other consents that are necessary for the completion of this development, are to be completed and approved by the relevant consent authority/s prior to the issue of an Occupation Certificate. The bond paid for this application will be held until Council is satisfied that no further works are to be carried out that may result in damage to Council’s road/footpath reserve. a At the commencement of building works and in perpetuity the property around the building to a distance of 40m or the property boundary, shall be maintained as an inner protection area(IPA)as outlined within section 4.1.3 and appendix 5 of ‘Planning for Bush Fire Protection 2006’ and the NSW Rural Fire Service’s document ‘Standards for asset protection zones’. c Fire fighting water supply tank(s) shall be located not less than 5m and not more than 20m from the approved structure. d A hardened ground surface for fire fighting truck access is to be constructed up to and within 4m of the fire fighting water supply. e New above ground fire fighting water supply storage’s are to be manufactured using non combustible material (concrete, metal, etc). Where existing fire fighting water supply storage’s are constructed of combustible (polycarbonate, plastic, fibreglass, etc) materials, they shall be shielded from the impact of radiant heat and direct flame contact. f Non combustible materials (concrete, metal, etc) will only be used to elevate or raise fire fighting water supply tank(s) above the natural ground level. g A 65mm metal Storz outlet with a gate or ball valve shall be fitted to any fire fighting water supply tank(s) and accessible for a fire fighting truck. The Storz outlet fitting shall not be located facing the hazard or the approved structure. h The gate or ball valve, pipes and tank penetration are adequate for full 50mm inner diameter water flow through the Storz fitting and are constructed of a metal material. i All associated fittings to the fire fighting water supply tank(s) shall be non-combustible. j Any below ground fire fighting water supply tank(s) constructed of combustible (polycarbonate, plastic, fibreglass, etc) materials shall be shielded from the impact of radiant heat and direct flame contact. k Any fire fighting water supply tank(s) located below ground shall be clearly delineated to prevent vehicles being driven over the tank. l All water supplies for fire fighting purposes shall be clearly signposted as a fire fighting water supply. m Below ground fire fighting water supply tank(s) shall have an access hole measuring a minimum 200mm x 200mm to allow fire fighting trucks to access water direct from the tank. n Fire fighting water supply tank(s) and associated fittings, located within 60m of a bushfire hazard and on the hazard side of an approved building, shall be provided with radiant heat shielding to protect the tank from bush fire impacts and maintain safe access to the water supply for fire fighters. o A minimum 5hp or 3kW petrol or diesel powered pump shall be made available to the water supply. A 19mm (internal diameter) fire hose and reel shall be connected to the pump. Fire hose reels must be installed so that each elevation of the building can be reached by a fire hose. The fire hose reels must be constructed in accordance with AS/NZS 1221:1997, Fire hose reels and installed in accordance with AS 2441—1988, Installation of fire hose reels, as in force on 1 September 2005.
p Pumps are to be shielded from the direct impacts of bush fire. ii Markers should be positioned adjacent to the most appropriate access for the water supply. Note: Below ground dedicated fire fighting water supply tank(s) is defined as that no part of the tanks(s) is to be located above natural ground level. r Reticulated or bottled gas is to be installed and maintained in accordance with Australian Standard AS/NZS 1596:2002: 'The storage and handling of LP gas' and the requirements of relevant authorities. Metal piping is to be used. q) All fixed gas cylinders are kept clear of all flammable materials to a distance of 10m and be shielded on the hazard side of the installation. r) Gas cylinders kept close to the building shall have release valves directed away from the building. Connections to and from gas cylinders are to be metal. s Polymer sheathed flexible gas supply lines to gas meters adjacent to building are not to be used. i The property access road shall comply with Section 4.1.3(2) of ‘Planning for Bush Fire Protection 2006’, excepting that an alternate property access road is not required. u New construction shall comply with Section 5 (BAL 12.5) Australian Standard AS3959-2009 'Construction of buildings in bush fire-prone areas' and section A3.7 Addendum Appendix 3 of 'Planning for Bush Fire Protection'. v Landscaping to the site is to comply with the principles of Appendix 5 of 'Planning for Bush Fire Protection 2006'. The figures show a 0.00% decrease in the number of DA’s received to May 2012 with construction costs decreasing by -151.04% compared to the same period in 2011. The total number of DA’s/CD’s approved for the month of May was 24 plus 1 modifications. Expressions of interest were sought from the Nambucca Heads and Macksville-Scotts Head Surf Life Saving Clubs as well as a quotation form Australian Lifeguard Service following Council’s resolution emanating from the Ordinary meeting on 11 April 2011 to receive a report regarding extending life guard services over the Easter break. Note the report and take no further action. Consider extending life guard service through Easter holiday period. Consider extending the hours of the life guard service from 9.00 am to 5.00 pm. Council wrote to the Nambucca and Macksville-Scotts Head Surf Life Saving Clubs seeking their interest in providing a life guard service and whether they were in a position to roster volunteers to cover patrols at the beaches for a fee over the Easter holiday period. The cost of the service would be paid directly to the Clubs for the volunteers’ time and not to the volunteers. The funds raised through the provision of this life guard service may then allow the Clubs an opportunity to embrace another source of fund raising to complement their other activities and sponsorship. Expressions of interest from the two Clubs closed on 31 May 2012. Nambucca Heads Surf Life Saving Club advised that they were not in a position to provide the service due to legal and charitable implications and had reservations of being able to ensure adequate volunteers were available for the designated period. Their letter is attached for Council’s information. At the time of preparing this report Council had not received any advice form the Macksville-Scotts Head Surf Life Saving Club. Australian Lifeguard Service provided a quotation which has been circulated as a confidential attachment for Council’s information. The cost of extending life guard services for the Easter holiday period has not been budgeted for in the draft 2012/13 budget and would need to be offset from funding at the detriment of other worthy infrastructure projects. There are no environment implications associated with this report. The service provides a public safety and education program as well as performing life saving and rescues. The provision of safe beaches is important to holiday visitors. The peak holiday period is December to January during the School holidays and life saving needs to be in place for that period as a minimum. There is a risk of confusion when adjoining Local Government areas have different arrangements. The funding for contract life guard services over the Christmas holiday period is provided within the 2011/12 budget and the draft 2012/13 budget has made a provision for the contract of services for the 2012/13 Christmas holiday period. Please find attached pricing for Beach Lifeguard services for the 2013 Easter Public Holidays. One point to note, Easter will be a standalone period from the Autumn school holidays in 2013. The pricing is inclusive of wage, gear and equipment, relevant insurance, maintenance, Supervisor and ALS Surfcom costs. If Council has any questions please do not hesitate to contact me.